At 12 years old, Kaleem Washington is like most other boys… he enjoys many sporting activities (football basketball, martial arts, dirt-biking and motor cross), science, and music. However, where he is different is that he has taken up activities that are not as common for a Black pre-teen such as tennis, lacrosse and yes… chess! Young Kaleem has begun to make a name for himself at the chessboard and has collected a sizeable collection of trophies from his tournament successes. Born in Washington, DC on June 4, 1990, the scholastic standout learned chess in 1999 at the #14 Boys and Girls Club in DC. Vaughn Bennett, Executive Director of the Olympic Chess House, taught Kaleem the moves and has been his coach ever since. His mother Willette Seaward describes her son as a "joyful, funny and relaxed child," but "focused and determined." "The key thing with Kaleem is that whatever he endeavors in, he approaches it vigorously, committed, excited, giving 100%. His main priority (also my main priority with all of the children and youth that I work with) is his education. Kaleem is doing very well in school, despite a very challenging academic curriculum." Being in the nation's capitol has it's advantages… an active chess community, strong players and dedicated coaches. Bennett has built as successful program and has also coached the students at Howard University. The DC-area also draws on the services of IM Oladapo Adu, FM Enkhbat Tegshuren and his wife, WIM Battsegseg Tsaagan of Mongolia. Both Tegshuren and Tsaagan participated together in the 2003 U.S. Championship. Thus, young Kaleem is surrounded by a wealth of chess knowledge. "I will never forget him shaking my hand immediately afterward, then jumping in the air and throwing his fist up saying 'Yeah!'" "Kaleem was in a three way tie for 1st place and they had to play five-minute blitz in a playoff to determine who would be the Champion. We do not play or train in blitz chess. Still Kaleem won both speed games and the title of Maryland State Champion. I will never forget him shaking my hand immediately afterward, then jumping in the air and throwing his fist up saying 'Yeah!'" 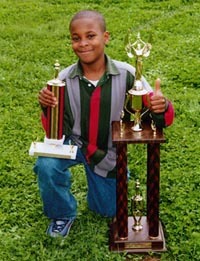 A week earlier he had won the Virginia K-8 Championship. According to Mr. Bennett, this is the first time in history that two state titles have been won on two consecutive weekends. With a current rating of 1261, Kaleem states that his best game was a draw with Harry Cohen, an Expert (2000+ USCF). While Kaleem doesn't have a favorite player, he employs the Sicilian with Black and the Scotch Gambit with white. Coach Bennett states that Kaleem has good board demeanor and is the ultimate professional. These characteristics will come in handy when he goes off to college to pursue his aspiration of being a doctor. Let's hope that this rising star will continue operate on his opponents at the board in an effort to be all that he can be.